Salt & pepper the chuck roast on each side. Heat the olive oil in a skillet, and brown the roast on each side. Place the roast in a slowcooker & top with the onion, green chiles, chili powder, garlic powder, & hot sauce. Pour in enough water to cover 1/3 of the roast & toss in the beef bouillon cube. Cover & cook on high for 6 hours, checking to be sure there is always at least a small amount of liquid in the bottom. Reduce heat to low & continue cooking for another 2 hours. Shred the meat, and let it cool. Taste it, and add more hot sauce if you want it spicier. I like mine plenty spicy. 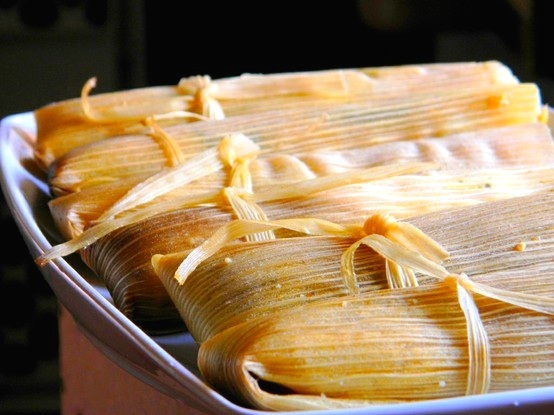 I refrigerate mine overnight & assemble the tamales the next day. Soak the corn husks in a large container full of warm water & allow to soak for 3 hours. Now, for the masa. Place the lard & salt in a large mixing bowl & beat on high speed until fluffy. Add masa harina & beat at a low speed until combined. Pour in beef broth a little at a time while mixing until the masa is the consistency of soft cookie dough. Drain water from husks. One at a time, flatten out each husk, with the narrow end facing you, and spread about 2 tablespoons of prepared masa mixture onto the top 2/3 of the husk. Spread about 2 tablespoons of meat mixture down the middle of the masa. Roll up the corn husk starting at one of the long sides. Fold the narrow end of the husk onto the rolled tamale & tied with a piece of cooking twice or a small strip of corn husk. Place tamales in a steamer basket in a stockpot. Steam over boiling water for 1 hour, or until masa is firm & holds it shape.